Outside groups that spent more than $2 million in last year’s heated N.C. Supreme Court justice race were highlighted this week in a report about the increasing role of Washington money in state judicial races. As part of an article looking at how national political funders are getting involved in local judicial races, the Center for Public Integrity focused on $1.2 million from the Republican State Leadership Council. The money flowed through to an ad featuring a banjo-strumming narrator singing about how N.C. Supreme Court Justice Paul Newby is tough on crime, according to the report. 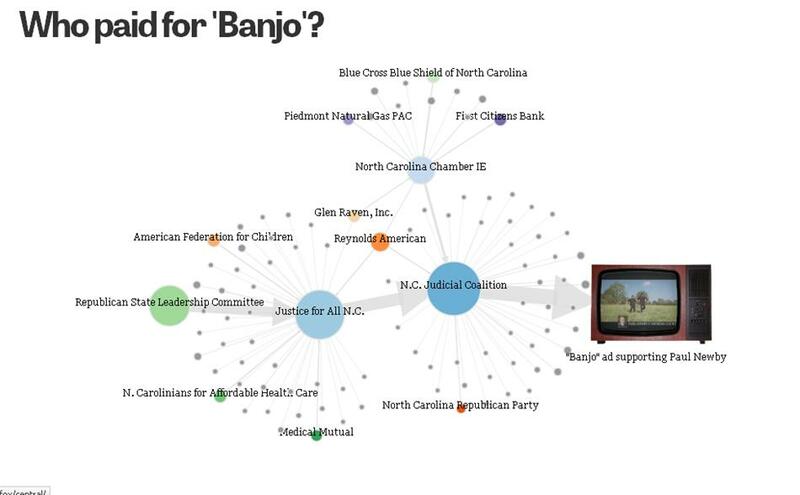 The neatest part of the CPI piece was this interactive graphic detailing how the money flowed through from the RSLC, companies and other political donors to the group that put out the Banjo ad. (Below is a screengrab, click here for the original graphic). And, if you really want to relieve the campaign season’s deluge of political commercials, you can watch the Banjo ad as well here. Well, when it works against you guys you report it. You publicize “secretive” organizations when the whole progressive scheme is funded by secretive forces such as George Soros. Heck he sent down some of his thugs to astroturf the Monday thing and you guys did not even notice…..maybe because he is a big funding source of this site? Hmmm…..